Home / Cartoons / The Porous Membrane: Why Corporate Blogging Works. The other day somebody asked me to explain why corporate blogging works. Sure, we know it’s the hot new thing and people are paying attention to it (including big media)…but why? Why does it work? Seriously.So I drew the diagram above. 1. In Cluetrain parlance, we say “markets are conversations”. 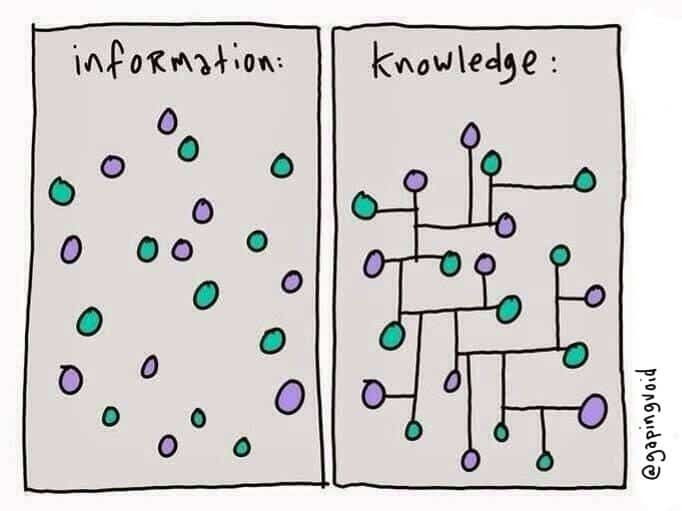 So the diagram above represents your market, or “The Conversation”. That is demarkated by the outer circle “y”. 2. There is a smaller, inner circle “x”. 3. So the entire market, the “conversation” is seperated into two distinct parts, the inner area “A” and the outer area “B”. 4. Area “A” represents your company, the people supplying the market. We call that “The Internal Conversation”. 5. 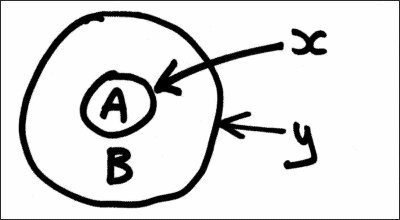 Area “B” represents the people in the market who are not making, but buying. Otherwise know as the customers. We call that “The External Conversation”. 6. So each market from a corporate point of view has an internal and external conversation. What seperates the two is a membrane, otherwise known as “x”. 7. Every company’s membrane is different, and controlled by a host of different technical and cultural factors. 8. Ideally, you want A and B to be identical as possible, or at least, in sync. The things that A is passionate about, B should also be passionate about. This we call “alignment”. A good example would be Apple. The people at Apple think the iPod is cool, and so do their customers. They are aligned. 11. The answer lies in “x”, the membrane that seperates A from B. The more porous the membrane, the easier it is for conversations between A and B, the internal and external, to happen. The easier for the conversations on both side of membrane “x” to adjust to the other, to become like the other. 13. The more porous your membrane (“x”), the easier it is for the internal conversation to inform and align with the external conversation, and vice versa. 15. Of course this begs the question, why have a membrane “x” at all? Why bother with such a hierarchy? But that’s another story. N.B. And yes, this works with internal blogs as well, poking holes in the membranes that seperate people within a corporate culture; aligning “the conversation” internally etc.The other advantage of internal blogging is that it organises conversation into a long-term manageable form. Two people sharing ideas via blogs is a lot more permanent, viral and useful for the company than two people sharing the same information over by the watercooler. Poking holes in membranes subverts hierarchies. Avast, ye scurvies etc. 2. The big play in corporate blogging is not eyeballs, it’s ALIGNMENT and CULTURE. Alignment precedes eyeballs, not the other way around. Meditate on this. 3. A corporate blog needs two things: i. It needs to be written by somebody who ACTUALLY knows how to write and ii. is not afraid of getting fired. Good luck finding that person etc. It is amazing that 6 years on your visual illustration still resonates – the know how to write bit isn’t understood yet by corporate America but it will be, eventually. Much yet to be done! all great information Hugh, thanks, and it would seem to point the ship in the direction of transparency. Something that society has been taught to have little regard for, from the majority of our political leaders to the majority of our business leaders and the spin doctors/marketeers/advertising folk in between. The Porous Membrane: Why Corporate Blogging Works. 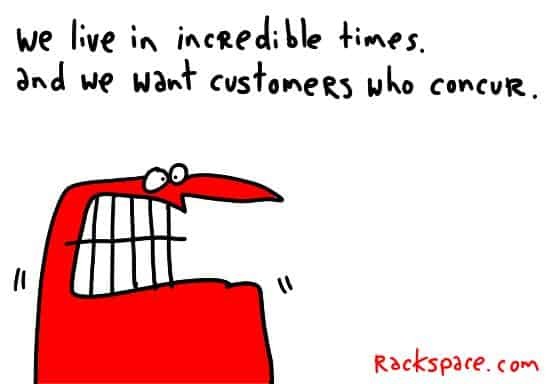 | gapingvoid – just great!